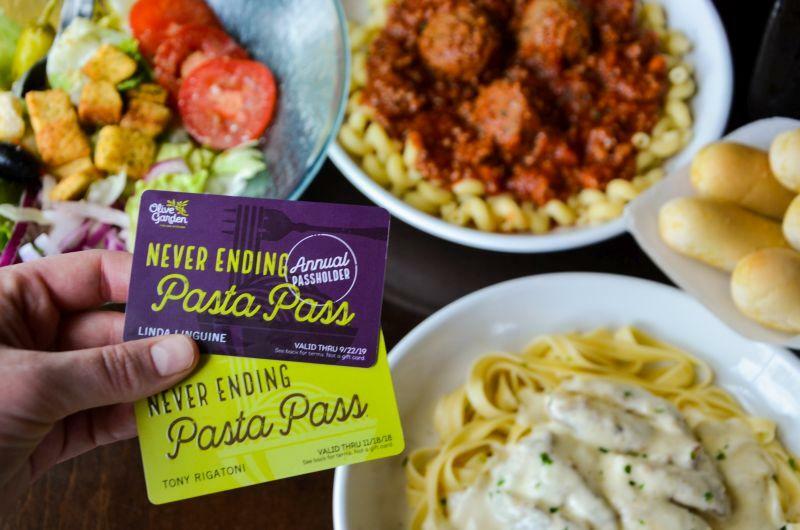 UPDATED: Wed., Aug. 22, 2018, 5:37 p.m.
Olive Garden’s Never Ending Pasta Pass is back. Passes go on sale Thursday afternoon, and Olive Garden fans can choose from two, limited-release options. For the first time, 1,000 Annual Pasta Passes will be available for $300. The pass is good for 52 weeks of unlimited servings of a guest’s favorite pastas, homemade sauces and toppings, accompanied by unlimited soup or salad and freshly baked breadsticks. Plus, 23,000 Never Ending Pasta Passes will be available for $100. With this option, a guest can access eight weeks of Olive Garden’s Never Ending Pasta Bowl promotion. This is the largest number of Pasta Passes that the restaurant has made available to guests. Last year, 22,000 Pasta Passes sold in less than one second. Both passes can be redeemed with the kick-off of Never Ending Pasta Bowl on Sept. 24. They are good through Nov. 18. Passes go on sale at 2 p.m. Eastern Time or 11 a.m. Pacific Time at www.PastaPass.com. Olive Garden has more than 850 restaurants. For more information, visit www.olivegarden.com. Published: Aug. 22, 2018, 5:34 p.m. Updated: Aug. 22, 2018, 5:37 p.m.